The extremely durable composite material developed by Matfer under the brand name Exoglass® will meet your high standards for sanitary hygiene in food contact environments. This material is non-porous, easy to clean and can be sterilized. This long-lasting material will not deteriorate or rust over time. Blade made of thermoplastic elastomer, resistant to temperatures up to 500° F. Handle made of composite plastic is dishwasher safe. 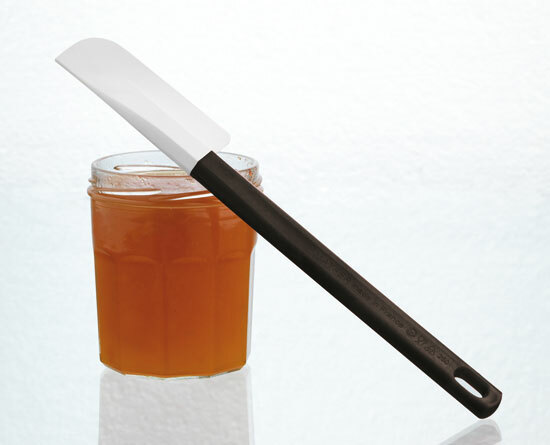 Spatula with narrow paddle, very practical for easy scraping and emptying of jam, mustard, sauce jars and Pacojet or Frix'Air jars.